River Valley Organics is an affiliate company of Filtrexx International. We supply and install filter soxx as a best management practice to contractors and developers around Pennsylvania. Filter soxx come in a variety of sizes and are designed primarily to replace silt fence although there are numerous other applications. please click on the Filtrexx name and go to the Filtrexx web site for additonal design information and design tools as well as for an international list of authorized installers. Filter soxx are a superior product that provide perimeter sediment control that is far more effective than traditional bmp’s are at cleaning stormwater runnoff. Filter soxx don’t fall dow. Your on site maintenance staff will love how easy it is to maintain filter soxx and will appreciate the easy installation that our trained and certified staff provide. Filter soxx and filter berms have been tested and approved by numerous organizations such as the USEPA , AASHTO, USDA, and PA DEP . Cost are generally quoted as an installed price and are based on a variety of variables such as location, access to the site and quantity of material needed. Please contact Doug Caldwell for any further pricing information. Compost blankets and Eco blankets are sustainable alternative to traditional rolled blankets and hydroseed applications. Compost is particularly effective in areas where poor soil conditions exist but also need to have vegetation on the slopes. 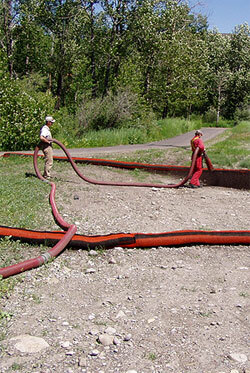 River Valley’s pneumatic application services provide a cost effective delivery system to install these products which act as both an erosion blanket and incorporate seed at the same time. *Based on failure point of 36 in (0.9 m) Super Silt Fence = 1000 ft (303 m) of slope, watershed width equivalent to receiving sediment filter, 1 in/ 24 hr (25 mm/24 hr) rain event.